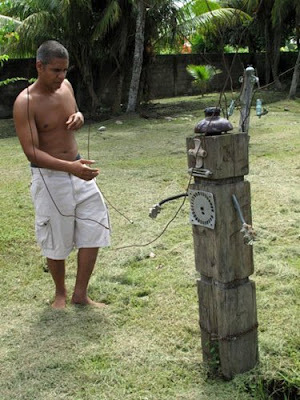 Roberto Tjon A Meeuw (born Paramaribo, 1969) is the first visual artist I interview for Paramaribo SPAN. He will be in Rotterdam from the end of July till October, as an artist in residence. I am familiar with his work, but have never really spoken with him about his art. He is self-educated, and definitely not mainstream. An independent. I meet him just two days before he's off to the Netherlands. With the family: his wife Hester and his sons Idris and Sonny. Of course with his family, because that's what it's all about. "I am easily filled and overflowing with love", Roberto says. "Even awakening in the morning is Walhalla to me. I feel thankful because I have woken today, my wife is lying next to me, my kids are there." The atmosphere in his colourful house, where we have our talk, is pleasant. All around us: art. By the children, by friends, by Tjon A Meeuw himself. And lots of records (he is a DJ too, DJ Prepmatic), lots of books. He is not pretentious--no intellectual highbrow conversations here. But the work which surrounds us speaks for itself. It is clearly influenced by graffiti and hiphop elements, never limited to a canvas in a regular frame. Pieces of window panes, broken furniture, old electricity poles: Tjon A Meeuw uses "garbage" as his medium. He literally starts from "scratch". "Do you consider yourself an artist?" I ask him. "I am an interpreter," he says. "I translate the messages I receive from the universe any way I can: through the art I make, through the music I play. I am a mailman. And the message I bring is love, pure love. So yes: I am an artist who delivers the mail." It sounds a bit hippie-ish maybe. But his mischieveous grin gives me the idea that he is for real. What sets Tjon A Meeuw apart, among other things of course, is that he is the first artist I've met participating in an exchange programme who is not talking in a grateful and humble tone about what he hopes to learn from this experience. No, Roberto Tjon A Meeuw is a man on a mission. He is going to get more ammo, to spread the word that a lot of good stuff is happening here in Suriname, and he's going to show the world just so. "Shoot some flares, bomb da place, we gaan gewoon law!" --"we'll just go crazy!" And again, that smile. Yeah, he knows Rotterdam was bombarded during the Second World War, and that you should be very careful with the words you choose. And then I grin, thinking about the words he chose for one of his t-shirt prints: "pang pang". * High quality pieces of clothing, very stylish design, and words from the gutter. The mailman delivering his message. Interesting that it puns on the American use of "bang" as well. that was one of his briliant ideas i like so much. also the chair in a replay store. Roberto Tjon A Meeuw, is a great Artist. I am looking forward to see more of his amazing work at his Exhibition in Rotterdam.